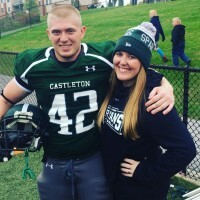 Sports Administration and the spirit of football games are what initially attracted Ashley Billings to Castleton. While attending University of Massachusetts – Amherst her freshman year, she realized that it wasn’t the right fit. Originally from nearby Ludlow, Vermont, Billings returned to the Green Mountains to complete her degree in sports administration. “I am proud to be a Castleton alum. As a Vermonter, it is important to me to support the education our state has to offer and while Castleton isn't the biggest school, I feel like it has the most heart,” she said. Billings recently earned a Master’s Degree in Elementary Education from Franklin Pierce University and has intersected her love of sports and education by teaching arts and humanities at Okemo Mountain School in her hometown. According to Billings, the foundation for her career was created at Castleton and the experience prepared her for working in a professional setting. At Castleton, Billings felt different than she did at her last school. She said she went from feeling like being just a number and a face in the crowd to having a place that she considered a second home. The first football game Billings attended on campus is what truly cemented her decision to transfer to Castleton. “I will never forget going to Castleton football games. The feel of the stadium and the students and staff was so great that I knew I wanted to be at a school like that,” she said.